I posted a picture on Instagram yesterday of this apple loaf I used to make in AmSam and have since gotten so many requests for the recipe (or just a slice) that I thought I’d share it here. Full disclosure: I have no idea where the original recipe came from. It could be from one of the hundreds of Kindle cookbooks I downloaded while we were overseas, or from somewhere on the internet. I don’t know if what I do even resembles the original, but it works pretty well. When I say “island style” what I mean is “using the limited resources available,” and not, say, “with pineapples and frangipani.” Just to be clear. See, the school cafeteria in Manu’a occassionally served tiny little apples, which the students mostly used as projectiles while we American teachers looked on sadly. These little apple seasons only lasted as long as the school had the supplies (remember the cafeteria workers were notorious for stealing food, so it wasn’t unusual to run out of things from time to time), but whenever they were available I hoarded them. My goal was always to make an apple pie, but sometimes I wasn’t able to collect enough before the ones I had started to go bad and then I had to scramble to find another recipe. This is one of my favorite not apple pie treats. ***If you have an electric mixer you may wish to use that instead, but then you’d be missing out on the real island experience. ***Here in Georgia I have an actual hand sifter; in Manu’a I just used a metal strainer. Sifting flour was, obviously, an extremely important step there to ensure no bugs made their way into your cakes or breads. Peel and slice apples. Try to keep them fairly thin, but it’s okay if a big ol’ boy makes his way in there every now and again. In your second bowl, cream together the butter with the rest of the sugar. Beat in eggs one at a time with your spatula. Toss in the vanilla. Sift together the flour and salt in your third bowl until they are well mixed. Using your fork, gradually mix the flour+salt combo into the butter+sugar mixture until you feel like your hand is going to fall off. Pour all of that into a small loaf pan (9x5ish). Bake in the oven at about 300 or 325 for about 1.5 hours. Maybe longer. I don’t know your oven situation. Just don’t let it burn, girl. Uma! That’s it! Eat this fresh and hot, or let it cool and have it with your coffee in the morning. If you want to really replicate the Manukan experience, slice about half of the loaf, wrap it up, and find a wandering teenager to deliver it to someone else in your neighborhood. 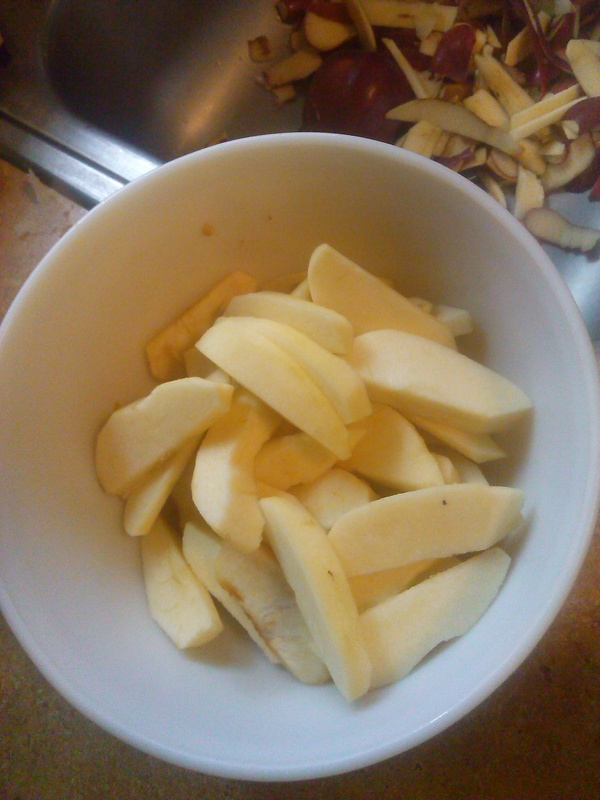 This entry was posted in American Samoa, United States and tagged apples, autumn, expat, island life, recipe. Bookmark the permalink. 3 Responses to And now for something entirely different: Apple Loaf, island style. It is funny (Cafeteria workers stealing food and materials) but it is so true. For some reason, living here makes it seem so the norm, but in reality, sometimes the “Samoanized” way of doing things just ain’t right. Malo Cat. Thanks for sharing! (In the virtual sense….have yet to see any of that be physically delivered to me…maybe the wandering teen got lost?) I wanna try to make it soon!